Ruth Gaines. 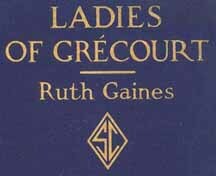 Ladies of Grécourt. 1920. Appendix. In June, 1918, this committee was succeeded by the Smith College War Service Board, of which the following persons have been members. Between June 1, 1917, and April 1, 1920, the Smith College Relief Unit Committee and its successor the Smith College War Service Board, have received in the form of general donations, and special gifts, interest, etc., $241,284.17. It should be noted that the War Service Board has maintained other Units with the Y.M.C.A. in France and under the Committee for Relief in the Near East, etc., so that the expenditures here given are only those connected with the Smith College Relief Unit. A sample monthly report of the Treasurer of the Unit, which is appended, gives an idea of the receipts and expenses of the Unit. Aside from the ordinary expenditures for the regular work of the Unit, during the year 1919-1920, two scholarships for nurses were given to Dr. Hamilton's School of Nursing in Bordeaux, to enable. the nurses to take the full course in that school. At the same time two scholarships were given to Pro Gallia, the Social Service School in Paris, to enable two pupils of that school to take their full course of two years. When the Smith College Relief Unit finishes its work in France, and turns its Hombleux plant over to the Secours d'Urgence, a subsidy, sufficient to carry on that post for some time, will be made to that organization. It is our expectation that from the balance which the Smith College Relief Unit has in its Treasury a permanent fund will be created which will be sufficient to provide four scholarships similar to those described above for the benefit of French women, and that certain hospitals in the Somme will receive gifts to enable them to make much needed repairs, and to purchase necessary equipment for the continuance of their work. Five children have been taken to Blérancourt for operations on the throat by the "American Women's Hospital." Eight more will be taken tomorrow, and we shall continue our care of them in the hospital. We have now a French nurse whom we are initiating into our work and whom we shall leave to replace us. Nearly 50 quarts of milk are sold each day. As all the inhabitants are furnished with the necessities the wholesale price is charged on purchases. The library bearing the name of "Elizabeth Russell," has now 700 books. There are two tiers of fiction or history and another tier has books on hygiene, travel, agriculture, science. About 200 books are in circulation, mostly among the children. We have only just received books for adults and have loaned to those who have asked for them. We are continuing the purchase of books in spite of the difficulties of getting them. The end we have in view with the children is first to interest them, but we employ different methods for their physical and moral development. We meet difficulties because of the differences of age, which prevent the making of groups. The villages are divided into two categories: (1) Those in which there are schools. (2) Those in which there are no schools. In the villages where there are schools we have classes in gymnastics given during school hours. In other villages we have classes in sewing and knitting. The classes are followed by games and exercises. On June 15 we had a party for the children, 160 taking part. After the different games and refreshments, they went to Vespers at the church in Grécourt. Nesle, le 4 Novembre 1917.
au SMITH COLLEGE, A GRÉCOURT. J'ai l'honneur de vous accuser réception du rapport si intéressant et si complet que vous avez bien voulu m'adresser sur l'oeuvre accomplie par vous et vos collaboratrices depuis votre arrivée à Grécourt. Je vous remercie bien vivement, et permettez-moi de vous féliciter pour les soins que vous prodiguez avec tant de générosité aux malheureux habitants d'une région si terriblement éprouvée. Votre programme de travaux est parfaitement établi et, en particulier, vos efforts pour les enfants méritent une approbation spéciale. Si vous voulez bien continuer à me tenir au courant de votre action, vous faciliterez l'organisation d'une indispensable coordination des secours que je voudrais rendre réellement effective ici. Croyez que de mon côté je ferai tout ce qui est en mon pouvoir pour faciliter votre développement, pour le plus grand bien de nos compatriotes victimes de la barbarie allemande. Veuillez agréer, Madame, l'assurance de ma considération la plus distinguée. Je ne peux pas quitter le commandement de mon secteur des pays réoccupés sans vous exprimer les sentiments de profonde admiration en même temps que de très vive gratitude que m'inspirent les inappréciables services que vous rendez depuis bientôt six mois, vous Miss Kelly, vos infirmières et toutes vos compagnes de Smith College, à la malheureuse population des pays dévastés par les Huns . . .
Sans vous et celles qui vous secondent si bien, les nombreux malades d'une population composée uniquement d'êtres faibles, femmes, vieillards, enfants (puisque les hommes sont soldats ou bien emmenés en captivité par l'ennemi) seraient abandonnés presque sans secours. En effet nos ressources de toutes sortes sont forcément insuffisantes devant l'immensité de la tâche, tout spécialement au point de vue médical. . . .
Veuillez bien agréer, Mademoiselle, l'assurance que je considère comme un honneur aussi bien que comme une très vive satisfaction l'occasion qui m'est donnée de manifester hautement l'estime profonde et l'admiration sans réserve que je professe pour vous et pour les nobles femmes venues des Etats-Unis avec vous au secours des Français victimes du Boche. Médaille d'Argent de la "Reconnaisance Française"
Smith College relief unit, société américaine: cette formation s'est occupée, depuis l'automne 1917, à soulager les populations civiles éprouvées. A apporté une aide morale et matérielle précieuse aux habitants des régions de la Somme libérées après la retraite allemande de mars 1917. Au cours de la retraite de l'armée britannique, en mars 1918, a apporté à la mission française et à l'armée britannique un concours inestimable pour évacuation de la population civile. Les infirmières américaines de cette formation conduisant des petites voitures sanitaires automobiles ont parcouru inlassablement, jour et nuit, les localités à évacuer sans souci du danger, ni de la fatigue, allant chercher des habitants jusque dans les régions bombardées et faisant preuve en maintes circonstances de calme et de bravoure. Mlle. Valentine, de nationalité américaine, membre de la Croix Rouge américaine de New York: a aidé, sous le bombardement, durant l'offensive de mars et avril 1918, à l'évacuation des malades, des vieillards et des enfants et à l'établissement de cantines et dortoirs sur le front de Montdidier, Poix et Beauvais. A déjà près de trois ans de service et s'occupe actuellement du ravitaillement de trente villages. Mlle. Wolfs, de nationalité américaine, membre de la Croix Rouge américaine de New York: a aidé sous le bombardement, durant l'offensive de mars et avril 1918, à l'évacuation des malades, des vieillards et des enfants et à l'établissement de cantines et dortoirs sur le front de Montdidier, Poix et Beauvais. A déjà près de trois ans de service et s'occupe actuellement du ravitaillement de trente villages. Journal Officiel du 7 Fév. 1920. The first day of the year, in France, is the day on which one presents his good wishes to all whom he loves. So we, the little pupils of the boys' school of Hombleux, would be remiss in our duty if we did not come on this occasion to present ours for the year which has begun. We offer to you the most ardent wishes we can make. We hope that this year of 1920 will smile upon you and give you all the happiness which you deserve. We shall never forget that we owe you most grateful appreciation for all that you have done for us. We are poor, we possess nothing that we could offer you in remembrance of this New Year's Day. However, our teacher has told us that we have our hearts with which to love and bless you. These hearts we offer you; they will be the best token of our gratitude. When you return to your noble country, the void caused by your departure will be great for us, but in spite of the distance, be sure that we shall never forget "the good American ladies of Grécourt." Please accept, Mademoiselle the Directress, and Ladies, the assurance of our most respectful regard. For the pupils of the Boys' School of Hombleux. Horses 130 1200f. 156,000f. 47 2500f. 117,500f. The enumeration of these various articles is necessarily very incomplete, since farming equipment comprises a host of objects belonging indoors; separators, pressers, grinders, churns, crushers, choppers, chaff-cutters, pumps, presses, fanning mills, sorters, etc. If the agricultural loss is to be reckoned, there should be added also all the harness. It should be understood that everything was destroyed. 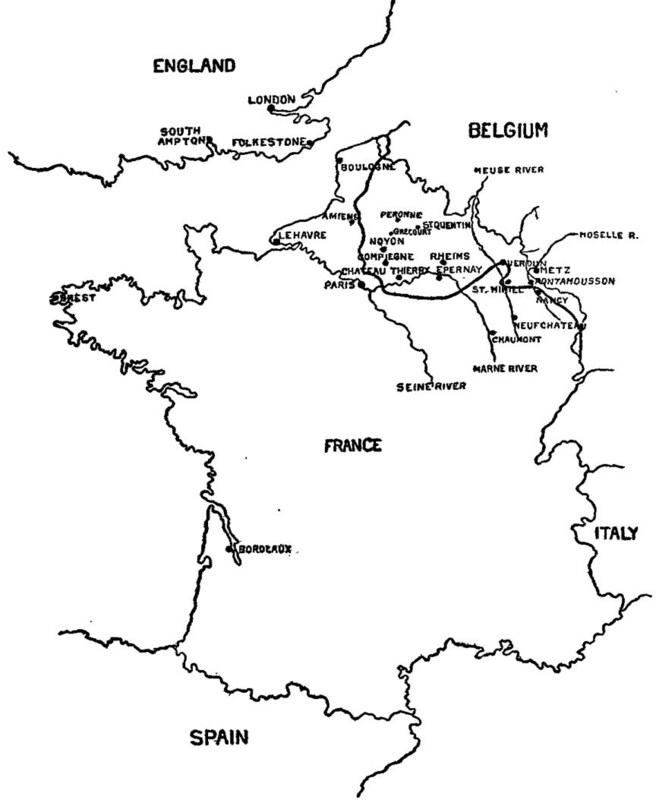 Property destroyed or taken: All the destruction was done by the Germans after they had carried off a part of the population to the north of France, and the other part to Rouy-le-Petitl near Nesle. During the absence of the inhabitants, the village was burned. Nothing was taken during the occupation, nor destroyed, except the crops. Farms cultivated: 5 farmers tried to farm with the aid of the army, and chance assistance, with some implements they recovered. Description. The commune of Eppeville is divided into three sections; Eppeville (about 150 inhabitants), the hamlet of Verlaines (about 300 inhabitants) and the annex of St. Grégoire (about 550 inhabitants) as one approaches the railroad station of Ham. Eppeville and Verlaines used to be essentially agricultural. St. Grégoire used to be the industrial section (sugar refinery, electric plant, warehouse covering several acres, oil mill, work shops for the making of agricultural instruments). The country was rich, the soil very fertile, there were pretty cottages with little gardens; the inhabitants lived at ease. The Occupation. On August 29, 1914, the Germans took possession of the commune. They commenced at once making requisitions; in the warehouses they found six million francs' worth of sugar and molasses. From August 29, 1914, to March 19, 1917, they occupied Eppeville, compelling the inhabitants to work for them, levying perquisitions and requisitions, sending away to Germany those who displeased them, every day issuing proclamations, giving orders, maltreating the populace. On July 2, 1916, an alarm! The Germans finding themselves menaced sent into the Department of the North, the men from 15 to 50 years of age. Alas! A month later they sent them back. First Departure of the Germans. On February 10, 1917, they sent away 110 men from 15 to 60 years of age, 22 women and girls, and on March 19, 1917, they made their famous strategic retreat on St. Quentin. But before leaving, they took away or destroyed the movable furniture, evacuated to Ham the inhabitants who remained, burned the houses, cut the fruit trees. For a year the ruins of the commune were occupied by French soldiers, and then in January, 1918, by English soldiers; about 500 inhabitants had remained. Life there was not gay, carried on always under bombardment by aeroplanes. Return of the Germans. Then, on March 22, 1918, the Germans erupted from St. Quentin, all the population was evacuated in a few hours, the Boches took possession again of Eppeville, and were arrested fifteen kilometers from Amiens. Today. On September 6, 1918, our enemies quitted Eppeville anew, at the victorious push of the Allies, and little by little the inhabitants began to come back to their ruins. Today 600 have returned, lodging in baraques, in cellars, in stables, in shelters which they have constructed themselves. The Role of America. During the occupation, from August 29, 1914, to March 19, 1917, the Germans having taken possession of everything, requisitioned horses and cows, penned up the hens, the population saw itself at the point of lacking the necessities of life. It is then that America sent us food; it was opportune. The inhabitants were rationed; the distribution of provisions was made under the control of the municipality. The American Ladies. In April, 1917, the doctors left our region. The sick were cared for with the greatest devotion by the American doctors installed in the ruins of the Château of Grécourt. They furnished us at the same time the necessary medicines, everything being without charge. After the second departure of the Boches, in September, 1918, we saw again the auto of these good ladies halt before the doors, to lavish upon all the words which comfort, the care which gives health, and the material gifts of all kinds which are indispensable to life. With all our hearts, we say to them: Thanks. The Battles. Eppeville is situated in the valley of the Somme. There it could not escape skirmishes and artillery combats, as the numerous ammunition dumps testify. The great struggles of the infantry took place on the neighboring heights, and on the surrounding plain. In spite of that, many Germans and many French soldiers are buried in the cemetery and in the fields. The Soldiers. 29. soldiers of Eppeville were killed by the enemy, 25 of the inhabitants died during the evacuations, and several were killed by bombs. How many have contracted the germs of incurable maladies! Conclusion. The Germans, during the occupation, had installed their "Kommandantur" at the town hall. "You must," they said, "obey us; we are the masters of the world. It is you who are staying with us." They exacted from the inhabitants the most passive obedience, they deported and maltreated a great number of them, and left us, according to their own expression, nothing but our two eyes with which to weep.